We had some wet weather recently (finally!). 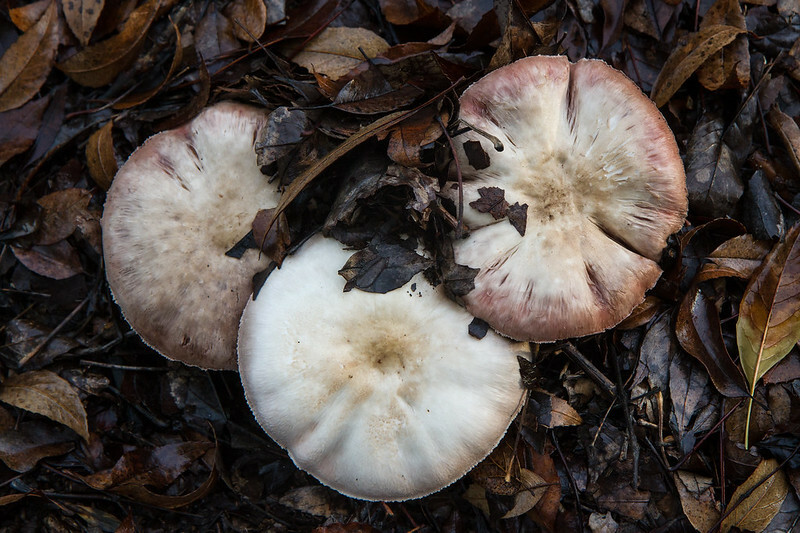 I found this trio of mushrooms at Anthony Chabot Regional Park at the start of a walk. I managed just two quick shots before we set off, and this one turned out nicely. I only know one type of mushroom, and this isn’t it so I can’t say anything more about these. I really like the subtle colors around the edges and the contrast with the wet leaves on the ground. 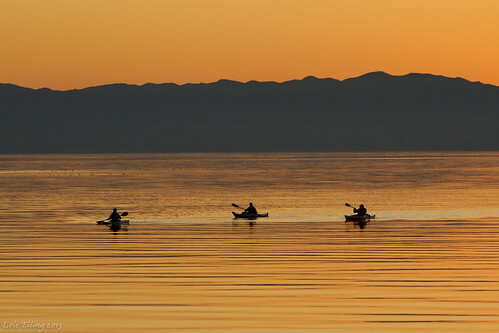 Kayakers Sunset Bay, a photo by CatDancing on Flickr. We’ve had a few pretty sunsets lately, but most of them I haven’t been able to get out and photograph. So Sunday I decided to go down to the marina and hope for a few nice pictures. It’s always fun and calming to explore the bay shore at sunset. Many people gather there, especially when the weather’s nice, as it was last night. A lot of them will just park at the edge of the water (many places available for that) and watch the sun set and the planes come in at the Oakland Airport. I’ll usually park somewhere and then walk and take pictures from different vantage points. There are always birds on the water and they look especially nice when the water is so calm. The sky didn’t have any clouds so, as sunsets go, it wasn’t very exciting. However, the golden color lasted a long time; it hung on to the Bay as if it wasn’t ready to go to bed quite yet. A trio of kayakers were out on the Bay for the sunset and they made a nice addition to this picture. Here’s one of my favorites from the evening. I’m thinking about my dad, who would have been 100 years old today. He was born on Easter in 1912, but never had his birthday land on Easter again until his 60th. His mother always thought of Easter as his birthday, though. His birth was just eight days before the famous sinking of the Titanic. My dad at 3-1/2 years old. My dad grew up in Los Angeles. He was smart in math and science at school, and even won a statewide contest for high school students. As a state winner, he got to travel (by train) across the country to compete with other state winners in 1929. They all met Thomas Edison, Henry Ford, and a third inventor, possibly Harvey Firestone. Of course his family was extremely proud and there was an article about him in their local paper. 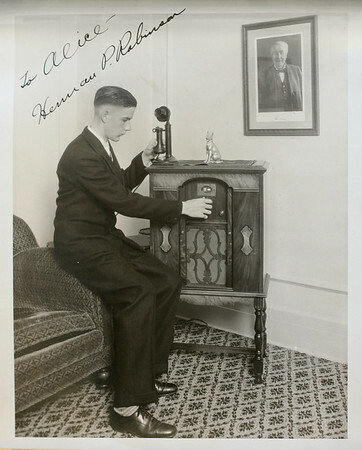 Dad with the radio awarded to him by Thomas Edison in 1929. Note the picture of Edison on the wall. This picture is inscribed to Alice, his sister. Although he’d hoped to attend the California Institute of Technology (Caltech), where he was offered a 1-year scholarship, he attended the University of Southern California (USC) because they offered him a 4-year scholarship. The decision of which college to attend was a no-brainer because the family didn’t have money for college. He graduated in 1934 with a degree in chemical engineering, and soon went to work for Shell Chemical. A few years later he went into the non-metallic mining business with a friend, although he later admitted he really didn’t care for the mining business. After World War II started, he was one of many to become involved in the Manhattan Project, the building of the atomic bomb. He researched plutonium at the University of Chicago under Glenn Seaborg, who was to become a long-time friend. After the end of the war, he came to Berkeley with Seaborg and others from the project and began an almost 30-year career at the Lawrence Berkeley Laboratory (then called the Lawrence Radiation Laboratory—the name later had to be changed because of the negative connotation of the word “radiation.”) At the Lab, he met my mother, who had also worked on the project as a secretary in Oak Ridge. Their mutual interest in photography brought them together. Photography remained one of his interests, along with chemistry, math, electronics, astronomy, and computers as they came of age. He bought himself an Apple II soon after they came out and then later bought himself a second one. He used it to do high level mathematical computations and wrote programs in assembly language for the Apple II. His hobby, especially after he retired, was computing constants (numbers) out to 30 or more digits. He could figure out how long a certain computation would last and this card was once placed on the computer to assure it wouldn’t be disturbed while completing a lengthy job. 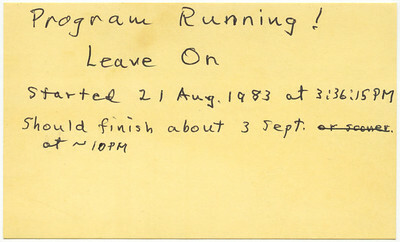 Sign on Dad's Apple II computer showing when the computations would finish. To my dad, math was a joy. He was a wealth of information if I needed any help with my math homework. However, I had to be careful about asking for assistance because a simple question could easily turn into a rather long, although enthusiastic, discussion on math. I’d only ask him if I had plenty of time for it. He also loved astronomy and I would occasionally accompany him to astronomical society lectures. I was very fortunate to go with him on two separate trips to view a total solar eclipse. Those were experiences I’ll never forget. In the summer of 1972 we went with my aunt to Tuktoyaktuk, above the arctic circle in the Northwest Territory of Canada. What a thrilling experience that was to watch the sun disappear in the middle of the day! Besides the eclipse, the whole trip was a fantastic experience. I can say the same thing of our next trip, the following year, to Kenya for another eclipse. Once we’d viewed the eclipse we spent several days touring the safari parks in Kenya. My dad wasn’t perfect, but he certainly did the best he knew how. He was always honest, almost to a fault. I’ll never forget his adding up the restaurant tab in his head everywhere we went. He would always correct the server, even if the mistake was in his favor. He was also quite modest about his level of intelligence; the family considered him to be very smart but he didn’t think of himself that way. Of course, he worked with several nobel prize winners and probably compared himself to them. He wasn’t an emotional man; the only time I saw him with tears in his eyes was soon after my mom had died. 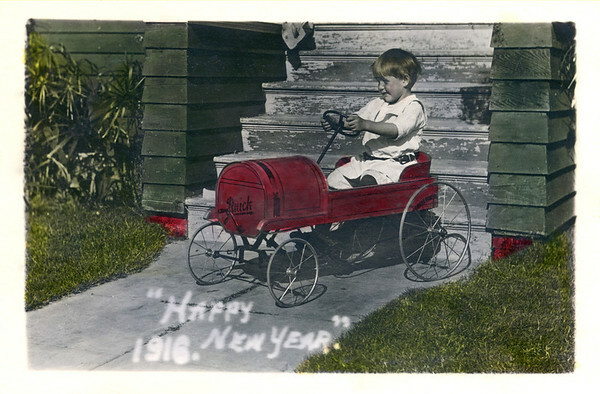 He was very frugal, probably from growing up during the depression. I remember him often complaining about how much something cost, especially when there was only a few cents worth of material in the item. He was aghast that I once spent about 98¢ on an Indian head penny. Of course, he’d probably seen many of them in circulation at one time, so they weren’t as interesting to him. 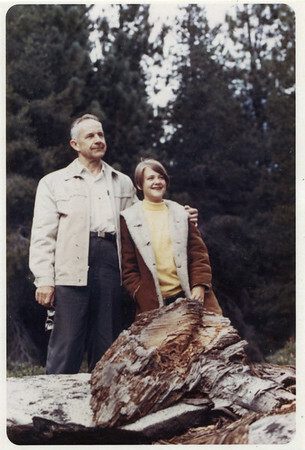 My dad and I near Lake Tahoe in 1968. Photo by my Aunt Alice. So, on this 100th anniversary of his birth, here’s a tribute to my dad and thanks for the parts of me that are so much like him. (And thanks for the many more parts of me that are like my mom!) I love you, Dad. I’ve been scanning and “restoring” quite a few old family pictures recently that were sent by a second cousin of mine in Colorado. Some pictures are of good quality, obviously taken by a professional. But, as is the case with most families, the majority of pictures were taken by family members. These are often of poorer quality with problems including being out of focus, camera movement blur, people too far away from the camera, not enough light, and other problems. 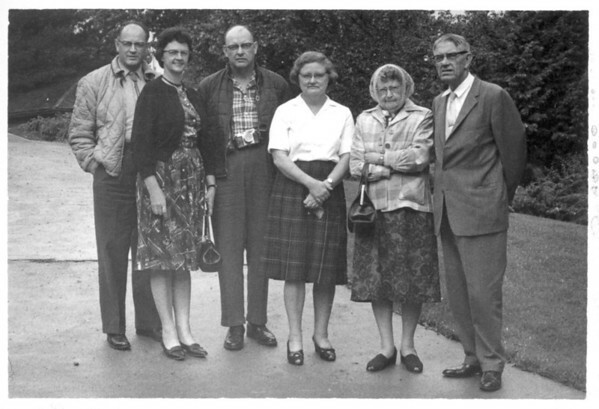 It’s a bit disappointing to know that a group shot of relatives I’ve never met could have been better made at the time. However, I’m also very grateful to the photographer for having taken these pictures at all and, sometimes, having made duplicate prints to give to family members. If it weren’t for these, I wouldn’t have known what these relatives looked like. A bad photo from the past is much better than no photo at all. Which brings us to the present. They say the best camera is the one you have with you. Perhaps an iPhone doesn’t take as high-quality photos as a digital SLR, but if that’s all that you have with you, then it’s the best one for the moment. My daughter-in-law shares many photos of our grandson by email. I’m so thankful for these snapshots sent every few days. They may occasionally be dark, blurry, or funny-colored, but I still get to see what our grandson is doing. I’d much rather receive iPhone pictures often than professional or studio pictures rarely! Besides, even if the quality isn’t equal to a professionally made photograph, she’ll often catch a special smile or expression that is priceless! I’ll take that any day. The picture at the top of this post was in this collection of photographs from my second cousin in Colorado. It shows my mother with her aunt and uncle plus two cousins and the wife of one of the cousins. All these relatives were visiting from out of state and are posing on our driveway. My dad not only took the picture but also printed it at home. He and my mom used the kitchen as a darkroom occasionally. The print is a bit grainy – probably the cheaper paper my dad would have used – and the back is labeled in my mother’s distinctive handwriting and turquoise-colored ink. Although I’ve long known that the quality of the prints my dad made could have been better, at least he made them. They often printed multiple copies for other family members, too. I’m sure this print was sent to Colorado relatives in the 60’s and it has now made it back to California for me to scan. I love that! I’ve been thinking how some families were into snapping pictures and sharing and others weren’t. In a collection of miscellaneous photographs from this branch, there are one or two families that seems to pop up in the pictures more than others. Some years they used a family group shot to create their Christmas greeting. They obviously took pictures of their kids regularly, but not only that, they shared prints with more distant family members. If they hadn’t, I wouldn’t have seen these pictures and would have hardly known these people existed. I’ve never met most of them, but would like to do so someday. The moral of all this? Take pictures of your family, your kids, your experiences, everything that interests you. Then share them with others, whether online, in emails, Facebook, whatever. Don’t forget to make prints of some of the most important pictures, too. Who knows what will happen to online content 30, 50, or 100 years from now. A photographic print may have a better chance of surviving than your pictures stored on someone else’s server. 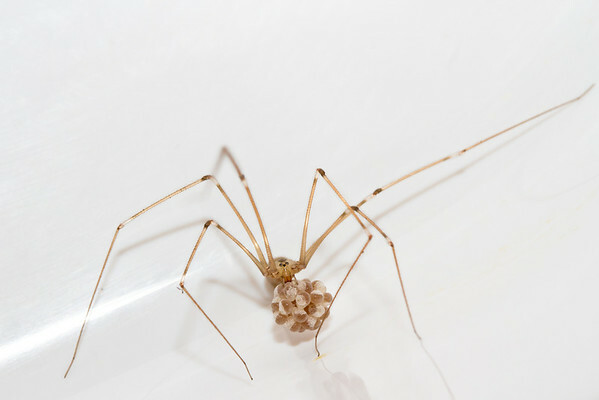 We have many of these cellar spiders in our house—too many, in fact. I feel that it’s partly my fault because I don’t like to kill them. I will catch and release spiders outside but more often than not I just let them be. Which means they’re left to multiply and build more messy webs. The other morning I found two in our kitchen and one had an object that didn’t look like a meal. I was getting ready for work so considered just leaving them alone, but I was fascinated by the object and thought it might be an egg sack. Ooooh! I’d love to photograph that. Long story short (errrr… sort of) I did pull out my camera, macro lens, flash and a large corning ware dish. I caught each spider and put the female in the dish. They can climb walls and many things, but have trouble with glass and ceramic. The white casserole dish made a decent photo studio and kept her in one place. 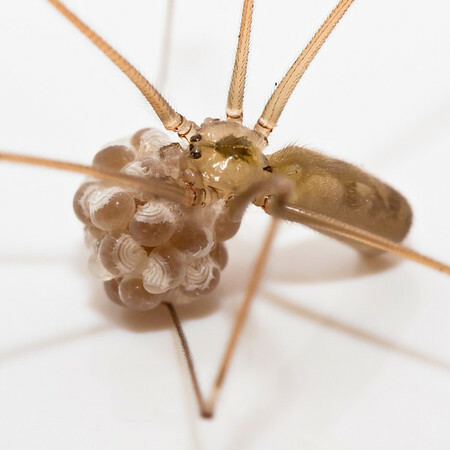 She was holding onto an egg sack and here are some pictures. I thought the pattern on the eggs was really something; they were certainly not what I’d expected. 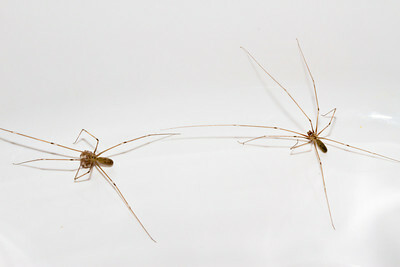 In many ways, these are uninteresting spiders. They don’t have much color, are extremely common, and leave their messy webs everywhere. As is often the case, however, there can be something interesting when you look very closely. The second was definitely a male, possibly her mate although she wasn’t particularly interested in him. She seemed pretty upset to be in the dish. After I snapped several shots I released them both outside. I’ve recently had several changes in my life, but they’ve been for the better. The first of September I left my job of almost three years and started a new one. In the process I also got a very different schedule; I’m working noon to 8:30. I do leave earlier on the two days of the week that I teach clogging; my bosses knew of my classes before I started and were fine with that. I’ve adjusted OK to this schedule, which has it’s plusses and minuses, of course. I feel the new job is working out; it’s quite different from what I’ve done for the last 25 years or so (working in the printing industry). Much of what I’m doing is not difficult or challenging, but I do get to be a little creative now and then and I like the people I work with, which is so important. Along with the new schedule—having mornings free—I started swimming laps three times a week. We’re fortunate to have a large indoor pool about 10 minutes away. I’ve always enjoyed swimming but rarely get to do it, so when I started I took it very easy and gradual. I’m not a fast swimmer but I am a comfortable swimmer. I’m now swimming twice as far as I did on my first day two months ago and feeling really good about it. This fall I upgraded to an iMac from an Apple G5 computer and I’m loving it. Along with the new computer I also have new office space—our sons’ old bedroom. Having the whole room gives me space for my photo projects and I’ve already filled it up. I’m really enjoying my new office. The last major change—and the most exciting—is the birth of our first grandchild at the end of May. He’s now five and a half months old and never ceases to make us smile. What a charmer! He lives about 6 hours away but thanks to the internet, email, cell phones, and videos, we get regular updates on his progress. We’re looking forward to seeing the family at Thanksgiving. Around the end of the year we’ll welcome our second grandchild, also a boy. The excitement continues. The picture at the top of the post was taken in the fall of 2009. 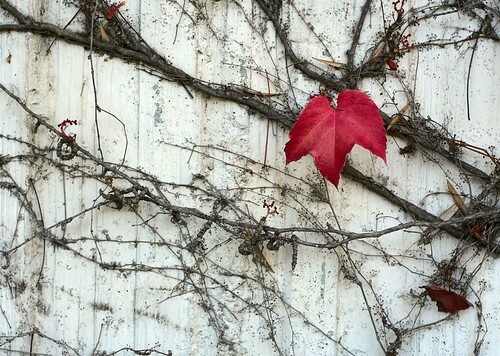 A solitary red leaf clings to an otherwise bare vine climbing a wall in Fremont, California. I’ve always loved old photographs. Both of my parents had plenty of old family pictures. I loved to pore over them and think about the lives of the people in them. Fortunately, my mom was very meticulous about labeling the pictures and even contacted other family members to help identify some. Needless to say, I ended up with the large bulk of these old photographs when we cleaned out our parents’ house many years ago. Several years ago I started scanning the pictures, logging each one into a database, and cleaning up a few of them with the very minimal Photoshop skills I had at the time. Over about 5 years I scanned, identified (as best I could), logged, and cleaned up over 600 photographs, including ones from my husband’s family. 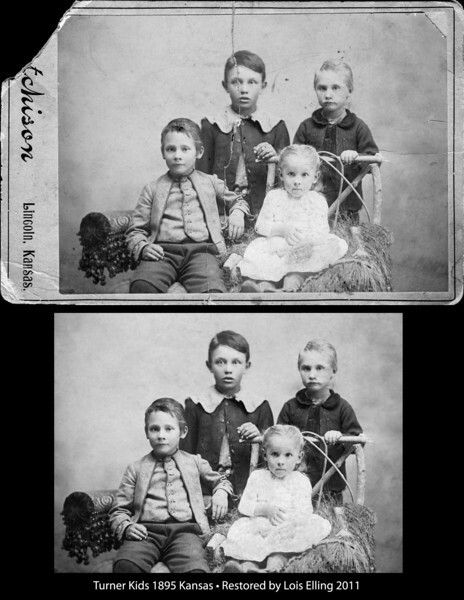 By scanning the pictures it has been so much easier to share them with other family members via email, online galleries, a CD, or prints made from the scans. Last year I started learning so much more about photo restoration and I hope to be able to even earn a little extra money by offering my services to others. I’m still learning, but am miles ahead of where I was when I started doing this years ago knowing nothing more than how to use the clone stamp. 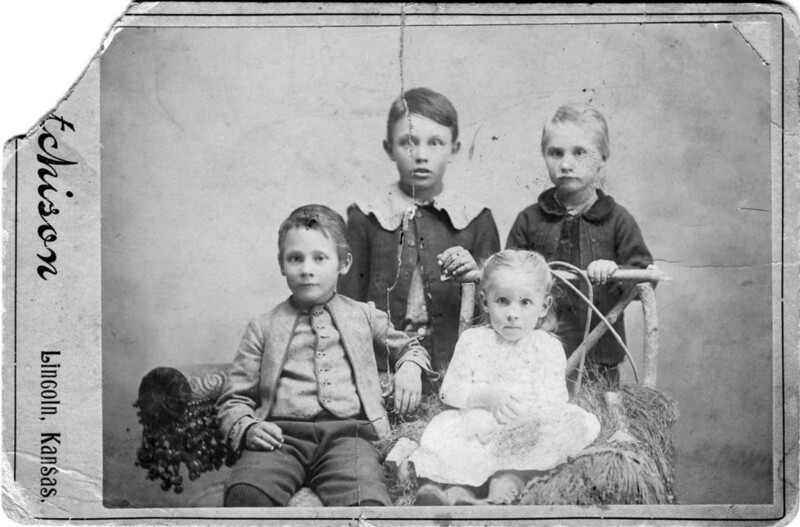 The picture above is an example of one of my family photographs taken in Kansas in 1895. This is a favorite picture of mine; I think the kids are adorable. The young blonde guy at the back right is my grandfather. The picture is especially poignant because their father didn’t take responsibility for the family and their mother died in 1901, leaving the kids to either fend for themselves or be taken in by caring relatives. At this size it’s hard to see all the restoration that was done other than the obvious tear running down the center. Besides the repair, I also added contrast, tried to bring out the detail in the girl’s dress, and “erased” the dark thumbprint on my grandfather’s face and jacket. Click on the picture to see the original in larger detail.